Innovation can come from hereditary tradition that is very closely related to our daily lives. That’s how a Japanese architectural firm, 403architecture create unique accents for their clients, young Japanese couples who want the firm to fix his room. The project is located in Hamamatsu, Japan. Almost the same as other typical Japanese room, rooms, Hamamatsu also repose wood sanded without varnished. Until this point, the rooms are actually still be used comfortably. Unfortunately, the ceiling is too low. To make it higher, 403architecture put off the ceiling which is made from wood. then they let ceiling “open”. Cements ceilings and hanging pipe gives the industrial impression to the room. For them, the answer to make simple and stylish accents of rustic from recycled materials is already in sight. The firm utilizes a sheet of wood from the ceiling to give character to the floor. 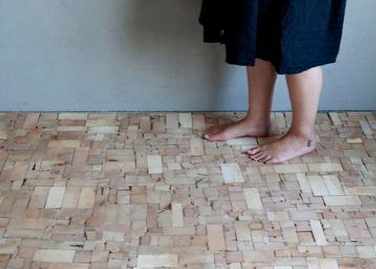 Wood that “migrated” from the ceiling become a smart alternative for carpet tatami. 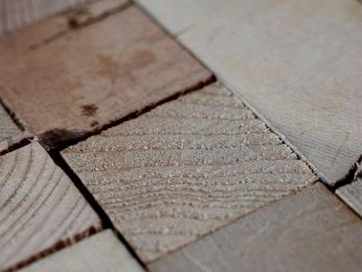 The firm makes small pieces of wood and set it on the floor. Wood pieces have shapes, colors, and different thicknesses. So, anyone who goes on it will feel the unique texture on the soles of their feet. The result is not only a unique texture. The firm has also made higher floor insulation with the ability to dampen the sound.